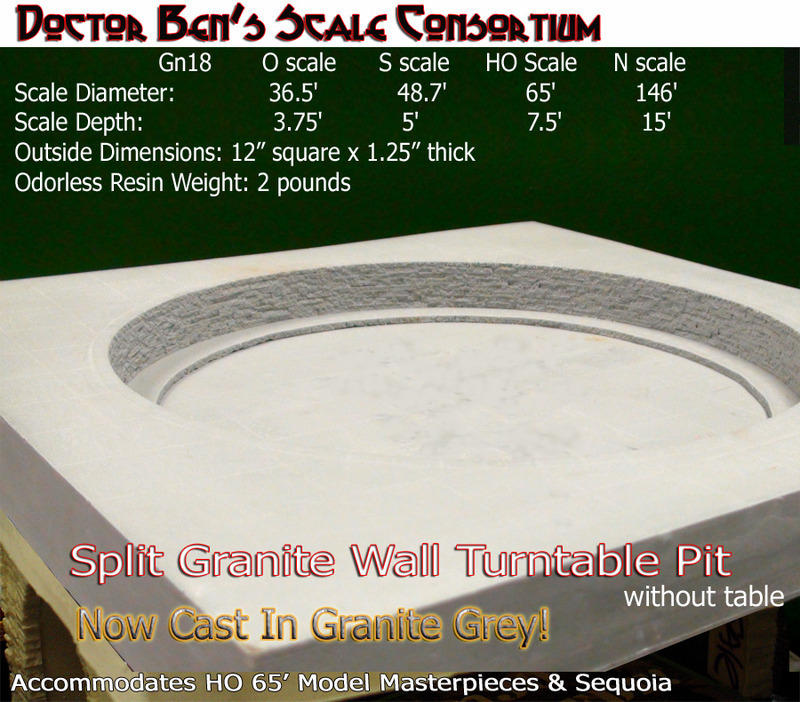 The dimensions of this Color-Cast Turntable Pit are 12" square overall with the pit dimensions of 9-1/8" diameter by 15/16" to the floor of the pit. The rail lip that you see in the image is 3/32" high by about 5/16" wide. The individual 3/32" BBBs are staggered as not to overlap joints. Each of these pits are cast in a very high and stable resin. This is done so that you will not have to worry about things warping and twisting around long after you have installed this pit into your layout. Still, the pit that you have received may (probably) have some tiny voids that were bubbles as result of the casting process. Typically, we pressurize our castings to pretty my void out these pockets. Unfortunately, the size of this pit does not fit our pressure pot, so there are a couple of things that you can do to remedy this situation. First, a tiny clump of grass/weeds picked up with small pointy tweezers and a dab of super glue pointed into the void makes it disappear right away! Another idea is to use a small Dremel bit and a dental pick to make the pockets more ragged like the split granite and aged over time and chunks have fallen off. These two ideas are what I prefer to do. If you are looking for that relatively new look (and what layout full of un-weathered buildings & rolling stock isn't) a small dab of Squadron White putty or Testor's Puddy with a small spatula will make quick work of the gaps. If you are not into those fancy puttys/puddys might we suggest using some paintable caulking or wood filler from the Big Box store instead? This Doctor Ben's Fine Scale Turntable Pit is fairly simple to install. Cut a 12? square hole where you would like the pit positioned in your layout; build up some framing; test the fit of the pit and get all the wiring ready to hook up. Begin priming and weathering as per the Doctor Ben's "How-To #1: Turning Toys into Models" booklet. Install circular piece of track (a two-gallon bucket will help you curve the metal track) and test fit (a few strategically placed pilot holes with track nails as locating pins aids this process well) and cement into place with some 5-minute epoxy. Weathering will hide any epoxy that seeps out.